The author would like to thank Peter Pesavento, Igor Rozenberg and Phillip Clark for their help with researching this chapter. A visualization of the 7K-L1 spacecraft during its final phase of entering orbit based on available information. The middle section of the payload fairing shown on the left could be released immediately after the separation from the third stage, while still on a ballistic trajectory, or ejected after the first firing of Block D in the initial parking orbit. The first flight-worthy 7K-L1 spacecraft was designated No. 2P, where "P" most likely stood for "prosteishiy" (simplified -- primarily in terms of the flight control system). (202) The vehicle was designated Number 2, because the 1P prototype was used for ground tests only. According to the majority of reliable sources, the first two L1 launches had no ambition to fly the vehicle nowhere near the Moon or return it back to Earth, probably because many of the elements of the L1 project, such as ground control network, could not be readied in time. 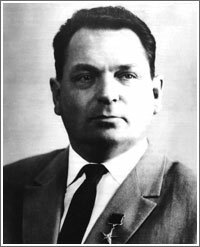 In his diaries as late as February 1967, Vasily Mishin, the head of TsKBEM design bureau, which built the L1 spacecraft, discusses the need to develop the long-range communications system, DRK, which would enable the flight around the Moon. In May 1967, Mishin also blamed delays in the L1 development on problems with the Argon-11 flight control computer, which indicates that this critical component was not available by the beginning of the L1 flight tests in March of 1967. Most sources agree that the real goal of the first L1 mission was to test the performance of the Block D space tug for the first time. The flight profile apparently included at least two engine firings of Block D, enabling the spacecraft to develop the second cosmic velocity and leave the Earth's gravitational field. Based on the timing of the launch, it is also apparent that the Moon was not targeted. (50) All other details of the flight plan and final orbit parameters planned for the mission remain a mystery half a century later. It is also unknown whether the separation of the L1 spacecraft from Block D and its maneuvering was planned during this first mission. As of May 6, 1966, the first launch of the L1 spacecraft was scheduled for Oct. 20, 1966, however, as the year progressed, cumulative delays pushed the mission well into 1967. The first Block D for the mission was shipped to Tyuratam in the wee hours of December 14, 1966. 1967 Jan. 18 - 23: Test fueling of the 1M1 mockup rocket (on the pad). 1967 Jan. 10: Arrival (of the spacecraft) to Processing Area No. 2 (Site 92?). As late as December 23, 1966, Mishin pondered whether to remove the emergency escape system from unmanned L1 vehicles, probably in an effort to save time in preparation for early tests. For the same reason, he apparently looked at the possibility of skipping the installation of solar attitude control avionics, ASO, into the aggregate compartment of the L1 spacecraft. He also explored whether it would be possible to fly the L1 spacecraft without the support of a telemetry tracking ship in the Atlantic. 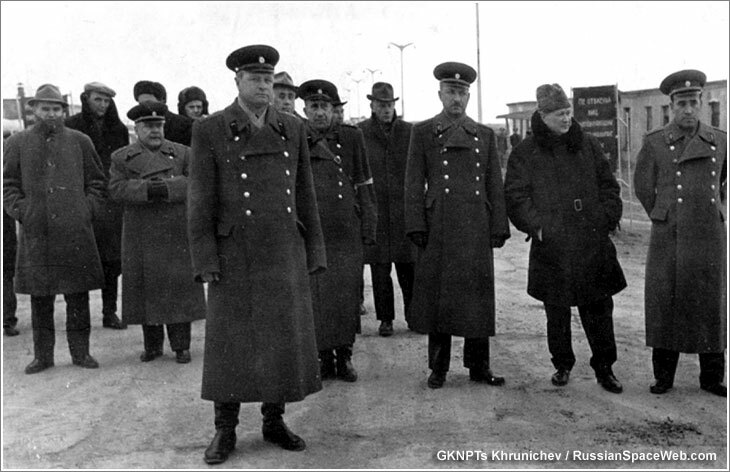 Members of the State Commission and military officers overseeing flight testing of the UR-500 (Proton) rocket in Tyuratam. Left to right: Valentin Glushko, Yuri Trufanov, Georgy Tyulin, Leonid Kaidalov, Vladimir Barmin, Ivan Pruglo, Aleksandr Konopatov, Aleksandr Kurushin, Vladimir Chelomei, Mikhail Druzhinin. On Dec. 30, 1966, right before the New Year's Eve of 1966, Tyulin convened the State Commission to review preparations for the first L1 launch. Most of its members reported readiness to fly between 15th and 20th of January 1967, upon the completion of upgrades to the launch complex. During the same meeting, Mikhail Ryazansky, who led the development of the flight control systems for the project, reported that an additional 100 million rubles would be required for the upgrades to the ground control network in order to communicate with L1 ships at lunar distances. Along with launch facilities, mission control was one of the issues pushing the project behind its ambitious schedule. When one month later, Nikolai Kamanin, the head of cosmonaut training, reviewed the timeline for the L1 processing, it called for the first L1 launch on Feb. 25, 1967. On February 16, 1967, from 15:00 to 19:30, an expanded session of the Chief Designers Council was held at the TsKBEM design bureau in Podlipki, just outside Moscow. As usual for the past year, the hectic gathering had to multi-task, first discussing the status of the Soyuz 7K-OK project, in particular the preparations for the first manned launch of Soyuz, followed by a review of the upcoming 7K-L1 missions. Despite all the pressure from the Kremlin, by that time, the launch of the first L1 spacecraft had already slipped to the end of February or beginning of March 1967. Four days later, Kamanin got a phone call from Tyulin, who told him to plan a trip to Tyuratam on February 24 for the launch of the L1 spacecraft. However by the next day, that schedule was pushed back by three or four days, probably by last-minute technical problems. (804) In the end, top managers did not leave Moscow until March 7, 1967. 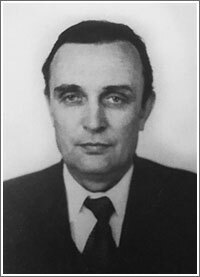 The team was led personally by Vasily Mishin, Chief Designer at TsKBEM. After its delivery to Tyuratam, the first L1 spacecraft was assembled at Site 31 on the east side of the space center and then moved to a processing building at Site 92, on the opposite end of the facility, where it was attached to the UR-500K rocket and finally rolled out to the just completed "Left" launch pad at Site 81. The UR-500K (Proton) rocket carrying the 7K-L1 No. 2P spacecraft lifted off from the "Left" launch pad at Site 81 on March 10, 1967, at 14:30:33 Moscow Time. It was the fifth launch for the Proton rocket, but its first flight with the Block D fourth stage and the L1 spacecraft. After the first three stages of the rocket accelerated its payload to a near-orbital velocity, the Block D No. 10L separated and performed a 109-second engine firing, entering an initial Earth's orbit. The third stage, lacking orbital speed, reentered the atmosphere and its remnants fell into the Pacific Ocean, east of Japan. In the meantime, a nearly 19-ton stack comprised of the L1 spacecraft and the Block D stage became the largest, heaviest Soviet spacecraft entering orbit to date. 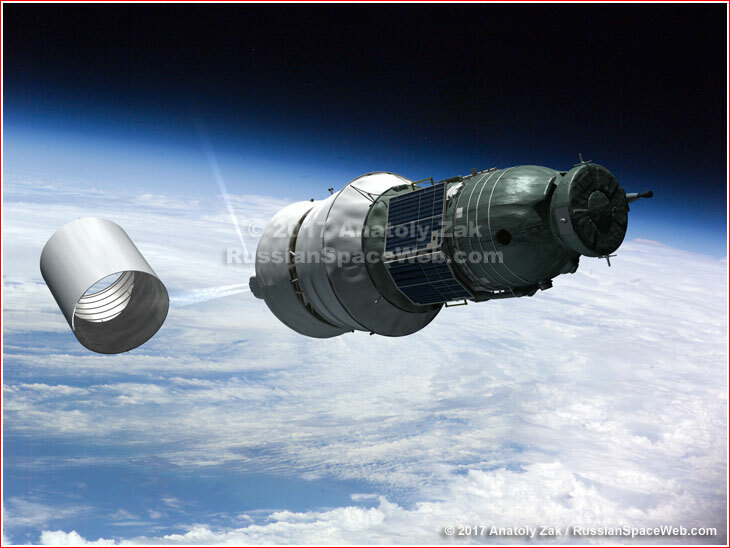 According to the official history of RKK Energia, during the mission, both firings of the Block D upper stage worked as planned and all systems onboard the L1 spacecraft functioned well, with the exception of the RDM-3 radio beacon and the Thermal Control System, STR. One can speculate that the first object was the L1/Block D stack itself, while the second could be the middle section of the payload fairing for some reason carried into orbit, instead of being ejected immediately after the separation of the third stage, which would save Block D some propellant during its first firing. Interestingly, both initial objects in the Kosmos-146 mission disappeared on March 11, or less than 24 hours later, which could mean a reentry or a sudden maneuver to a drastically new orbit. It is well known, that the flight profile of the L1 mission, like many other spacecraft relying on Block D, called for the separation of two ullage motors from the space tug, soon after they had provided proper orientation of the stack and the beginning of the final firing of the main engine. 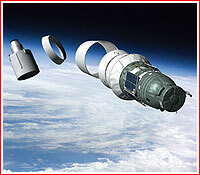 Therefore, the two objects accompanying the Kosmos-146 mission were likely those small thruster pods ejected at the beginning of the second maneuver. What is strange is that in future L1 missions (as in most similar flights), the second firing of the Block D and the separation of the thruster pods would take place just after one revolution around the Earth, while Kosmos-146 waited for about 24 hours before the second firing. It has been long suggested that perhaps the Kosmos-146 mission simulated a potential two-launch scenario, which had been considered at the time for future manned circumlunar missions. Under such a provisional plan, the L1 spacecraft would be launched unmanned to avoid putting cosmonauts on the unproven UR-500K rocket. In case of a successful orbital insertion, the crew would follow into Earth's orbit on the 7K-OK spacecraft boosted by a more reliable Soyuz launcher. The crew would then dock with the L1 and board it for a subsequent departure toward the Moon with the help of Block D. This two-launch scenario still remained on the table at the time of the Kosmos-146 mission, before being shelved later in 1967, in favor of the one-launch flight profile. According to Sven Grahn, a veteran space observer and a space radio expert, back on Earth, a number of radio monitors believed that they had picked short-wave signals coming from at least one object associated with Kosmos-146. Grahn explained the use of a short-wave radio (capable of sending signals globally beyond the direct line of sight of the spacecraft) by the need to keep Block D operational much longer than one orbit, which otherwise could be monitored by a tracking ship deployed in the Atlantic within a direct view of the powered portion of the flight. However, another reason could be an attempt to fly Kosmos-146 without the support of a tracking ship, exactly like Mishin had discussed in his notes at the time. In any case, it is safe to assume that Kosmos-146 did at least begin its push away from Earth and into deep space. To add to the confusion, according to the NORAD data, not one but two objects (1967-021A and 021C) launched on March 10, appeared to be making a slight maneuver bumping their perigees from 180 to around 184 kilometers, one of which then disappeared on March 11, while another (identified as the main spacecraft) continued lingering in low orbit until March 18. The same database also shows Object 1967-021B, originating on March 12, slowly spiraling down in low Earth's orbit until March 19. Most likely, this utterly confusing picture conflates data from different objects, as it is known to be the case with a few other missions in the NORAD database. After the end of the Cold War, newly released sources said that the second Block D maneuver aiming to accelerate Kosmos-146 to the second cosmic speed had been cut shortly before the completion of the planned 474-second burn by a command from the ground due to problems in the flight control system, which led to a deviation from the prescribed trajectory. (231) As a result, the spacecraft reentered the atmosphere and apparently burned up on March 11. (227) Why this fact was seemingly ignored by Mishin, Kamanin, Chertok and Glushko is difficult to explain. It is also unclear what happened to the descent module, which apparently had an operational reentry system. Moreover, the official history of RKK Energia claiming that the radio beacon of the spacecraft was beeping for 42 hours, also points toward a much longer mission of Kosmos-146 than its reentry on March 11. Despite all the secrecy surrounding Kosmos-146, the US intelligence quickly sorted out some key aspects of the mission. According to a document dated March 17, 1967, (just a week after the launch) and obtained by a space historian Peter Pesavento, Kosmos-146 was immediately suspected of testing "propulsion and payload systems for manned circumlunar flight." Moreover, the document correctly deduced that a Soviet flight around the Moon had been planned during the same year. 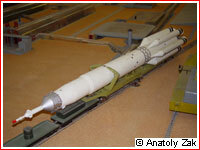 The US intelligence had also established that the SL-9 rocket (the US name for the UR-500 Proton) which had lifted Kosmos-146, was equipped with a new upper stage for the first time, even though US experts confused the third and fourth stages. "After injection into orbit, the 3rd stage remained attached to the payload for the first 16 revolutions," the report said. A still-classified portion of the document seemingly says that US intelligence sources indicated that the second firing of what we now know was Block D had taken place during the 17th orbit of the mission. The radar then lost track of the spacecraft, suggesting that it could either have reentered the Earth's atmosphere at high speed to test the heat shield or entered a highly elliptical and even deep-space trajectory. Based on the tracking of two spherical objects estimated at three and four feet in diameter in a slightly higher orbit than that of Kosmos-146, the authors of the report favor the deep-space-trajectory hypothesis. The US analysis also established a link between Kosmos-146 and the previous two Soyuz 7K-OK missions, at the time identified only as Kosmos-133 and Kosmos-140. 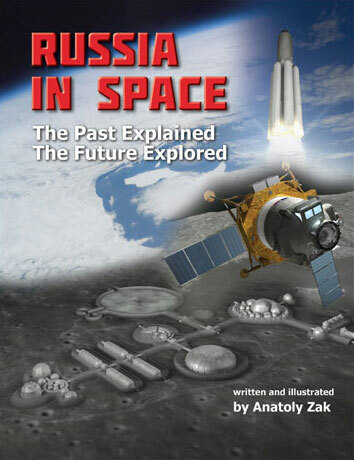 However, the design of either 7K-OK or 7K-L1 spacecraft was apparently still unknown to the US intelligence at the time, because the report speculates that "the SL-9 propulsion system with an optimized third stage would be adequate to launch a modified Voskhod weighing approximately 14,000 lbs with two men aboard into a circumlunar flight." NIP-3, -4, -12, Military unit, v/ch 03080. A four-stage Proton rocket with the Block D space tug and the 7K-L1 spacecraft shortly before liftoff.